POOL AND HOT TUB: Hours OF USE: DAWN to DUSK. The pool and hot tub are to be used entirely at the own risk of the Unit occupants and their registered guests. Pool and hot tub use is restricted to registered occupants and approved registered guests only. Children must be supervised by an adult at all times while in the pool/hot tub area. NO DIVING, BEACH OR SAND TOYS IN THE POOL. NO THROWING OF BALLS, TOYS or RUNNING shall be permitted in the POOL/HOT TUB AREA. NO GLASS SHALL BE PERMITTED IN POOL/HOT TUB AREA. Pool is located off property. If you’re looking for relaxation, there’s not a more suitable destination than our beautiful "It's A SHORE THING" We offer accommodations for all needs. Included with your stay: Complimentary Bicycles, Beach chairs, Beach-Towels, Free-rides around Siesta and a 7-day week office for your convenience and guest needs. Whether you are looking to stay in a small romantic One Bedroom Unit that sleep 4 (Key Largo) or our second floor 3 bedroom (Marathon) sleeps 8.Our Gulfview (Islamorada) unit on the third floor has a great view and also sleeps 8. 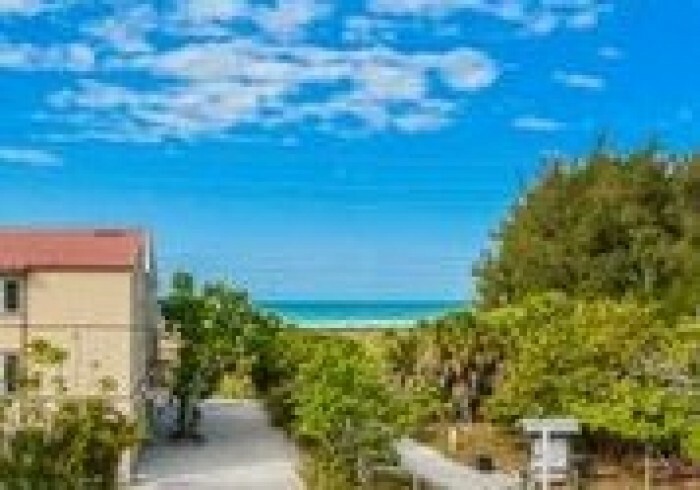 All three of these units are right across the street from the Beach or A SHORE THING if you prefer.We have accommodations to fit any budget and lifestyle. Once you arrive, breathe in the salt air and leave all your worries behind. Siesta Key, an internationally known destination, and Voted #1 beach in America time and time again. Walk on the beach and you can savor the rare white quartz sand, bask in the rays of the sun and delight in the sights and sounds of the Gulf of Mexico.